This book is intended for non-Egyptians who plan to live and work in Egypt, and want assistance in preparing for the assignment. It provides advice on how to fit in with the local Egyptian culture. This book is written for people from Western countries (Europe, North America, Australia, etc.) who intend to move to Egypt and live there for some extended period of time. It addresses the things that a person might need to know who is planning to spend time there as a university student, business professional, or government official. Most of the information it provides would not be relevant to someone merely visiting Egypt as a tourist for a week or two. The book begins with some basic background information - a brief overview of Egypt from the perspective of economy, natural resources, government structure, and Pharaonic history. From there, it delves into modern-day culture. The modern-day culture chapters are the ones that I find particularly interesting. They address relationships with friends, business relationships, dating and marriage, religion, social class, verbal and nonverbal communication, respective roles of men and women, gifts, baksheesh and tipping, dining etiquette, and compliments. Egyptian culture is definitely different from Western culture when it comes to these issues. For each such topic, the book describes both the general concept and then uses examples to illustrate key points. Other chapters offer a practical guide to the logistics of establishing a household in Egypt, including how to rent an apartment, bringing pets along, transportation, laundry, medical care, household appliances, etc. These topics are described well, with the kind of pragmatic advice that someone planning to live in Egypt would find important to have. A chapter called "Cultural Quiz" offers an interesting way to help the reader figure out how to apply the topics the book has discussed. It describes several hypothetical situations which could possibly arise when visiting Egypt, then invites the reader to choose which of several possible courses of action would be the most appropriate one. It then goes on to offer feedback on the pros and cons of each possible choice, advising which would probably lead to the best results. A "Do's and Don'ts" appendix contains a summary of key points that previously appeared throughout the book, serving as a quick review of what the book covered and a convenient reference tool. Several reference chapters include a glossary of Egyptian terminology, a calendar of festivals, a resource guide, and suggetsions for further reading. You are making plans to live in Egypt for some period of time. You enjoy reading about the customs and lifestyles of other cultures, whether you plan to visit the country or not. You go to Egypt once or twice a year on a regular basis, and are beginning to develop friendships and business contacts over time with Egyptians. You like to do Egyptian-style raqs sharqi and you'd like to assimilate some cultural information to enhance your dance expression. You're doing research on Egyptian culture. You're planning to go to Egypt only once, as a tourist. You have no plans to visit Egypt. The book's description of how Egyptians view business meetings, personal relationships, alcohol consumption, honor, social class, male/female roles, punctuality, verbal communication, body language, dining etiquette, and tipping practices are all consistent with my own observations in the many trips that I have made to Egypt. The book is thorough, tackling all the topics I can think of that I would want to know about if I were planning to live in Egypt myself for an extended period of time. It covers everything from household appliances and apartmental rental to pets. I enjoy the author's writing style. The book is easy to read, but at the same time it is informative. This makes it an interesting book to read just for recreational purposes, even for people who are not actually planning to travel to Egypt. 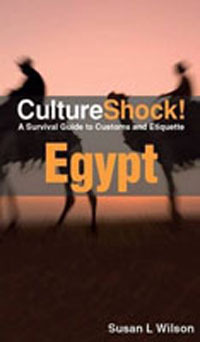 The cultural quiz is both entertaining to take and informative in the insights it offers on how Egyptian people think. A useful index makes it easy to go back and reference sections I want to find again. The section with some common Egyptian vocabulary is not very useful to me. This is mostly because the pronunciation guide for those Egyptian words that I already know don't make sense to me. Therefore, I would be uncomfortable trying to guess the pronunciation of words I don't already know based on this book's transliterations. Much of the information in this book is geared to the issues that would concern people who would be living there for a year or more, such as having pets, marrying an Egyptian, obtaining an apartment, etc. If you are planning to live there for an extended period of time, you will probably find this book useful in preparing for the big move. I don't think this book would offer much practical assistance to someone who plans to go to Egypt only once as a tourist, with no intention of returning. That's not the type of reader the book is aiming to assist. A typical tourist guidebook would be a better fit for the one-time visitor. If you decide to buy a copy, be sure to purchase the most recent edition. This review is based on the 2001 edition, and many things in Egypt have changed since it was published. It's important to obtain a current edition so you can read current, accurate information.